A yorkiepoo is a dog that is one-half Yorkshire terrier and one-half poodle. These dogs tend to be relatively small (usually between 4 and 14 lbs. ), since both parents are small breeds. Even though yorkiepoos may be little in stature, they usually are feisty and energetic. 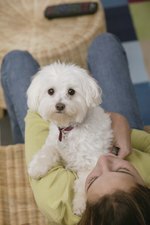 One of the primary means of taking care of a yorkiepoo is making sure that it gets the nutrition that it needs to promote growth (for puppies), health and activity. Allow your yorkiepoo to nurse from its mother for the first eight weeks of life. Introduce solid food to a yorkiepoo puppy at about three to four weeks of age. This helps the puppy to transition once it is old enough to be weaned. Mix 1/3 cup water with 1/2 cup of dry puppy food and allow the water to soak in until the food is very soft before giving it to your puppy. Do this two to three times a day. Feed your puppy three to four times a day between eight weeks and three to four months of age. Continue to use a premium puppy food and give your puppy the amount recommended on the bag. The bag should have a chart that gives recommendations based on weight. Reduce your puppy's feedings to twice a day after four to six months of age, and continue to give puppy food rather than adult dog food. Switch to a premium adult dog food when your puppy is approximately one year old. Consult your veterinarian before making the switch in order to make sure that your pet is ready. Switch gradually by mixing one-half puppy food and one-half dog food for the first week or two. Continue to follow the guidelines on the bag of food concerning the amount to give your yorkiepoo . Most adult yorkiepoos require between 1/2 cup and 2.5 cups of food daily.